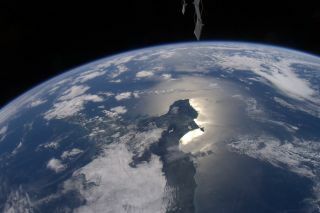 This photo of Earth from the International Space Station was taken by NASA astronaut Ron Garan, who has been blogging about the planet's beauty on his website Fragile Oasis. This image, taken on April 15, 2011, was Garan's first photo sent via Twitter. AUSTIN, Texas — It's a popular saying that international borders aren't visible from space, but it's just not true, says one veteran astronaut. The political lines between countries are sometimes obvious from orbit in the form of environmental differences, said former NASA astronaut John Grunsfeld, who is now the associate administrator for NASA's Science Mission Directorate. "Wealthy countries are lined in green and then you see the country next door that has no water," Grunsfeld said Wednesday (Jan. 11) at a NASA Town Hall here at the 219th meeting of the American Astronomical Society. Divergences in the amount of electricity visible at night and forestation can also reveal national boundaries. "The big thing is, no matter where I was on planet Earth, what you see is we are changing the planet," Grunsfeld said. Grunsfeld flew on the space shuttle five times, including three visits to service the Hubble Space Telescope. Those missions spanned 14 years, providing Grunsfeld with ample time to observe humankind's growing impact on Earth. He noticed more forest clearing, more dammed rivers, and fewer trees in places like Madagascar, he said. "It's really very disturbing," Grunsfeld said. The astronaut also busted another popular myth about viewing Earth from space — that the Great Wall of China is clearly visible. "Personally with binoculars I could see no evidence of the Great Wall of China," Grunsfeld said. You can follow SPACE.com assistant managing editor Clara Moskowitz on Twitter @ClaraMoskowitz. Follow SPACE.com for the latest in space science and exploration news on Twitter @Spacedotcom and on Facebook.